See what's next with Upcoming. Brief tasks or long notes; up to you. Swipe down, write down, done. With special list Upcoming, you’ll always know what’s next. It shows your tasks sorted by due date. Today’s tasks are right on top and you can reorder them. This order is also reflected in the notification. 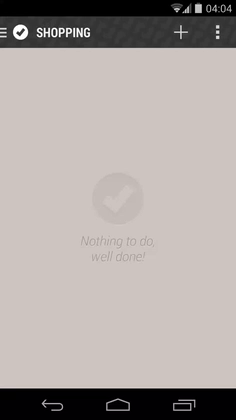 Quickly access your current task right through the notification drawer. 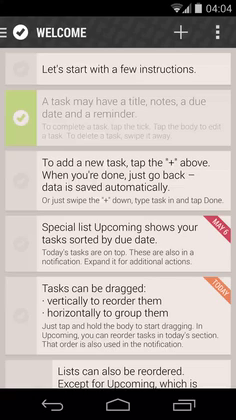 You can complete or postpone the shown task right from the notification or move between today’s tasks. The order in which they show up is set in Upcoming. Swiping away a task doesn’t mean it’s lost. It goes into Archive. It’s a special list that stores your deleted tasks from all lists. You can easily restore an archived task to it’s original list and continue working on it. 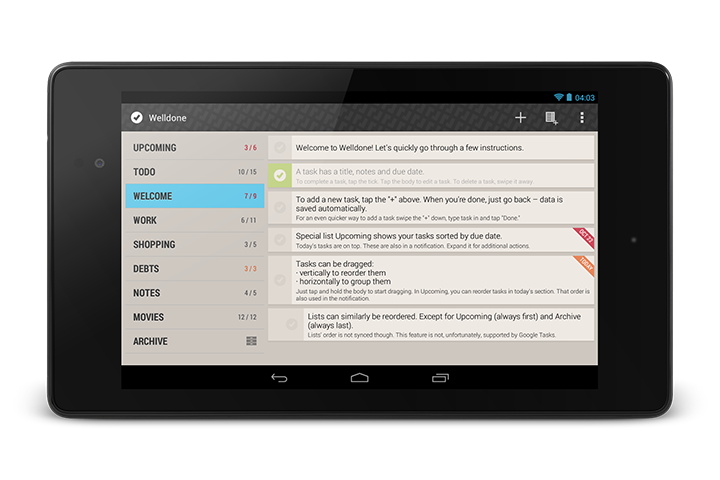 Welldone is a full-fledged Google Tasks client. Your lists and tasks are synced periodically in the background and intelligently after making changes. But sync is optional – if you want to, you can use Welldone without a Google account and without sync. 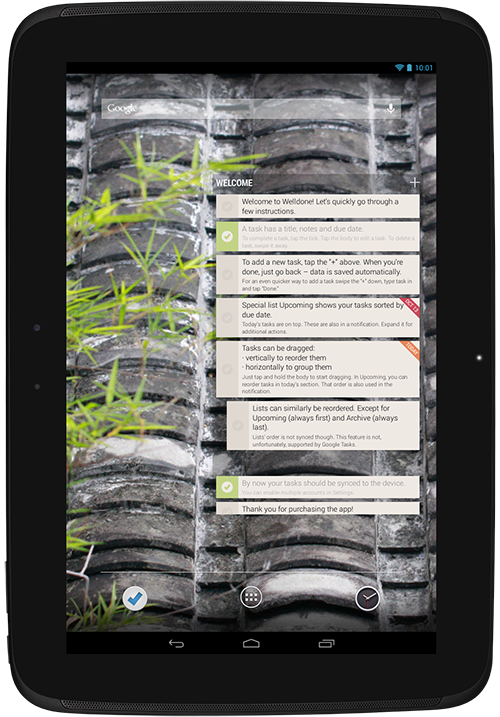 A two-pane layout used on tablets in landscape mode lets you move between your lists with one tap. Also, task editing on tablets in landscape mode uses a reordered layout that makes it easier and faster. Welldone adheres to Android design guidelines, but adds a custom touch. 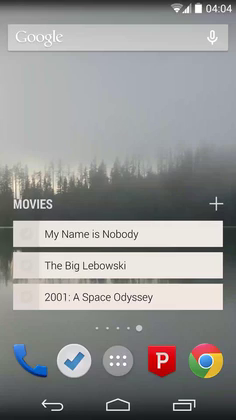 Everything from dialogs and widgets to action bar is styled in Welldone’s colors, giving it a unique look, but at the same time staying consistent with Android’s beautiful Holo theme. To make Welldone smooth and fast has been a priority from the very beginning. Every action should be as fluid as possible. Scrolling a long list with tasks, opening the drawer, swiping a task away – smooth. Time-based reminders for tasks make sure you never forget something important during the day. When reminder’s time is reached, a notification shows up with a sound. 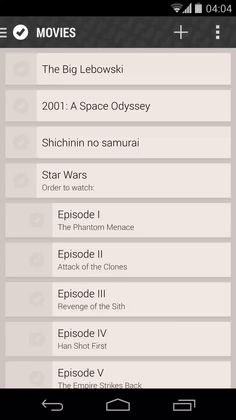 The easiest way to see a whole list is to use a widget on your home screen. Add it, pick a list and always quickly see what you’ve got to do. Everything in Welldone works even if you’ve got no internet access at the moment. Any changes you make are stored locally. Later, once your device is connected again, the changes are synced up. Have you got more than just one Google account? No problem. In Settings you can enable as many accounts as you need. The only difference you’ll notice is that you can choose which account to use to add a new list.